Saint John Vianney Catholic Church - Stained Glass Inc.
Stained glass is a classic addition to any Catholic church. It adds charm and beauty as well as reflective color that brightens the worship space and stirs emotion. 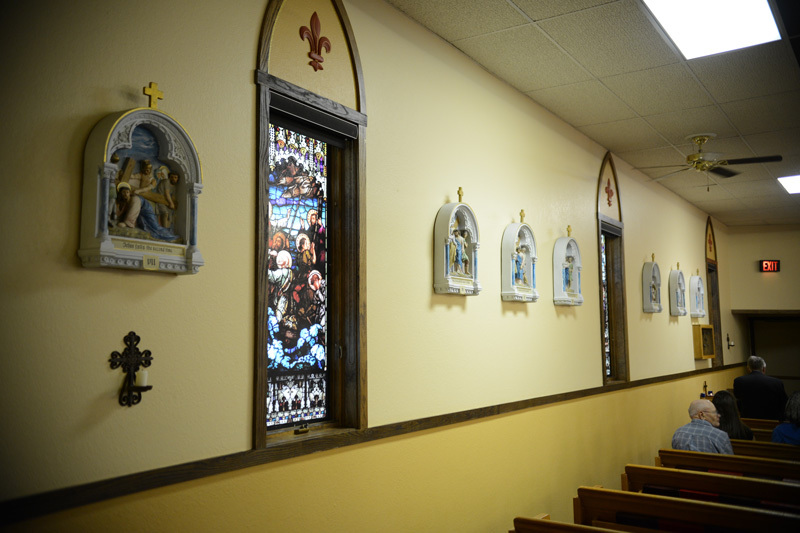 Knowing the benefits of stained glass, Father Eric sought to have window inserts added to his Montana parish church. When searching for the perfect designs, Father Eric came across Stained Glass Inc.’s huge selection of Christian images. Our online catalog showcases many sets of designs that feature matching borders and styles and Fr. Eric found a number of designs that he felt might fit in his church. Our staff at Stained Glass Inc. helped Fr. Eric make his image selection by listening to his needs and narrowing our choices down to just those that fit his specifications. Fr. Eric chose six Gothic designs from the Life of Christ. His selections included the Resurrection scene, the Calming of the Sea of Galilee, the story of the Widow’s Mite, and others. Each window insert was made to perfectly fit the approximately 2’ by 5’ window openings in the existing parish church. We used tempered safety glass to create these particular panels and they quickly slipped right into place when installed. Father Eric is very pleased with the artwork and lead time, saying "… we received them in time and they're up. They look beautiful!"